Members of the Eastern girls cross country team pose for a picture following the Division III district championship. Standing from left to right are Rhiannon Morris, Ally Durst, Jessica Cook, Kaitlyn Hawk, Whitney Durst, Lexa Hayes and Alysa Howard. 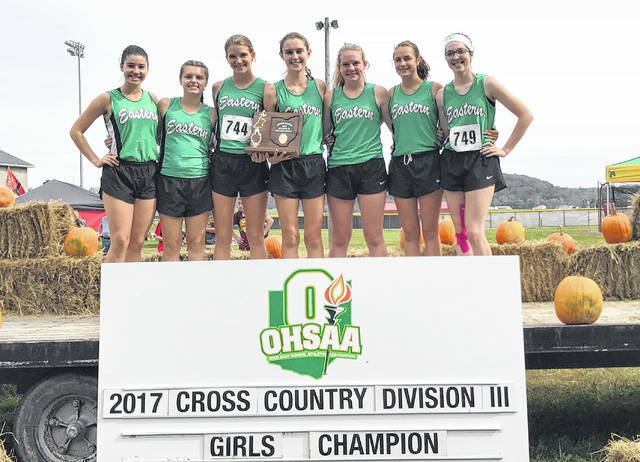 RIO GRANDE, Ohio — The Lady Eagles only added to their postseason cross country success on Saturday. That’s because Eastern amassed its seventh consecutive Division III district championship, as the annual Southeast District meets took place at the University of Rio Grande. It was once again one large race, part of four on the day for the entire district, but the top two Division III clubs out of 26 total are declared district winners. For the seventh straight year, Eastern is a district champion, although on Saturday — like last year — the Lady Eagles actually were the second-place team overall. The seven-lady Lady Eagles earned a team score of 70, trailing only Zane Trace’s 59 for the overall lowest score. In fact, the top six Eastern scorers all placed between third and 34th, as there were 184 runners in the girls Division III race. Eastern was one of seven girls squads to qualify for Saturday’s Division III regional meet — which will once again take place at Pickerington North High School. Eastern also advanced both of its boys runners to the regional, as Southern qualified one girl and one boy to the next round. In addition to the top seven girls teams, individuals which place in the top 28 of the girls race and the top 24 in the boys run also advance. For the Lady Eagles, senior Jessica Cook captured a third-place individual finish in 20 minutes and 38 seconds, trailing only champion Jenny Seas of Peebles and runner-up Ciara Colwell of Leesburg Fairfield. The standout Seas completed the 5K distance in six seconds shy of an even 19 minutes, while Colwell crossed the finish line in exactly 20 minutes flat. Right behind behind Cook for Eastern was junior Ally Durst, who finished fifth in 20 minutes and 48 ticks —and only 10 seconds behind Cook. Between Cook and Durst was Crooksville sophomore Savannah Morehead, who was fourth overall in 20:44. The next four Eastern runners were junior Rhiannon Morris (17th in 22:05), freshman Whitney Durst (28th in 22:51), sophomore Lexa Hayes (32nd in 23:00) and senior Kaitlyn Hawk (34th in 23:03). Cook and Hawk have advanced from the district meet in all four years of their high school careers. The only other Eastern runner was freshman Alysa Howard, who was 96th overall in 27:08. Besides Eastern and Zane Trace, the other regional-qualifying clubs were Leesburg Fairfield (129), Peebles (134), Westfall (149), Eastern Brown (202) and Minford (296). Southern was 13th in the team totals with a 382, as sophomore Sydney Roush advanced as an individual, finishing 15th in 21:56. This will be Roush’s first regional run, as she improved from a 41st-place finish in last year’s district meet. The remaining Lady Tornado runners were junior Mallory Johnson (61st in 24:44), junior Kathryn Matson (99th in 27:18), junior Madison Lisle (107th in 27:48) and sophomore Addie Matson (159th in 31:30). South Gallia was represented by one runner —sophomore Alex Lu (91st in 26:48). On the boys side, Eastern senior Owen Arix (10th in 17:23) and sophomore teammate Colton Reynolds (11th in 17:25) — separated by a mere two seconds —crossed the finish line back-to-back to advance as individuals. Right behind the Eagle tandem was Southern’s sole qualifier —senior Larry Dunn in 17th overall in 17 minutes and 44 seconds. Dunn is actually now a two-time regional qualifier, having improved by one place and five seconds from a year ago. The Tornadoes’ two other runners were fellow senior Dakota Kowell (80th in 20:39) and freshman Jared Koenig (85th in 20:46). South Gallia’s only runners were freshmen Garrett Frazee (46th in 19:35) and Griffin Davis (135th in 23:23). There were 162 runners in the boys Division III race, as Matt Seas — in 16:31 — completed Peebles’ individual sweep. Visit www.baumspage.com for a complete list of results of the 2017 Division III Southeast District meets.